The flag of Ethiopia features three horizontal bands, each of a different color. The top band is green and it represents the land. Yellow is the center band and symbolizes peace and hope. Finally, the final band is red and represents strength. The flag also features a disc in the center with a star and sun rays. This design is designed to symbolize the unity and diversity of Ethiopia, with the sun rays also serving as a symbol of prosperity. There is a total of four colors in the Ethiopian flag. The most prominent colors are the three bands that make up the field, which are green, yellow and red from top to bottom. The flag also has a blue disc in the center, and a star with the rays of the sun in the center, which are colored yellow. Each of the colors symbolizes a different trait. The blue is peace, the yellow stands for peace and hope, red is for strength and green is for the land. In the late 19th century, it was ordered that three pennants were combined to create a tricolor flag. Menelik II was behind this order, and he also had the first letter of his own name placed on the center stripe. The flag was later revised to remove the letter in 1914. 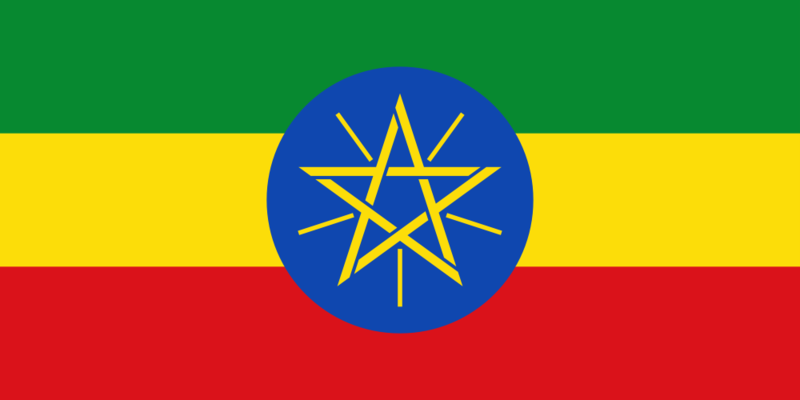 The modern flag featuring the symbol of Ethiopia was adopted in 1996. Ethiopia’s flag was modified in 1996 to make the center disc larger. In 2009, original flags not featuring the national emblem were banned by the Parliament of Ethiopia. Those that fly a flag without this emblem face up to 18 months of prison or a monetary fine.